Eighty percent (80%) of people who are infected with West Nile Virus (WNV) will show no symptoms at all. Up to 20% of the people who become infected will experience West Nile Fever. Symptoms can last for as short as a few days, though even healthy people have become sick for several weeks. About one in 150 people infected with WNV will develop severe illness known as West Nile Neuroinvasive Disease (WNND). Symptoms may last several weeks, and neurological effects may be permanent. West Nile Fever (WNF)–fever, headache, sore throat, body aches, fatigue, skin rash and swollen lymph glands. West Nile Neuroinvasive Disease (WNND) – headache, high fever, stiff neck, disorientation, tremors, convulsions, muscle weakness, coma and paralysis. When an area has mosquito samples that test positive for WNV, Fort Bend County Road & Bridge, or the appropriate city department, takes a focused response to prevent mosquito breeding by increasing spraying and larviciding in the area until a sample of mosquitoes tests negative for the virus. Fort Bend County does NOT spray for nuisance mosquitoes. Mosquitoes are sprayed for vector borne disease prevention only. Testing is conducted by trapping mosquitoes and submitting the sample to be tested for viruses. Mosquitoes positive for WNV do not necessarily lead to human cases of disease. There have been no human cases of WNV in the County so far this year. Fort Bend County monitors the type and numbers of mosquitoes present and submits samples for WNV testing. The County also sprays for nuisance mosquitoes but increases spraying and larviciding in areas where mosquito samples have tested positive for WNV. 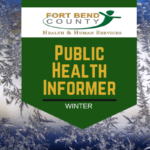 Fort Bend County Health & Human Services encourages all residents, regardless of their location, to protect themselves and family against mosquito bites. Remember the 4D’s: dress in loose light colored clothing to cover legs and arms, use repellent that contains DEET, avoid going outside at dusk and dawn, and drain standing water. Spraying can only impact the mosquitoes where the spray reaches. Some backyards with high privacy fences can not be sprayed by a spray truck. The best practice to prevent mosquitoes around the home is to drain any standing water (flowerpots, trash cans) and if necessary, spray yards with commercial sprays available at most home improvement stores. Together, we can reduce the risk of WNV in our communities. West Nile Virus is a potentially serious illness that spreads when infected mosquitoes bite humans and other animals. Symptoms include high fever, headaches, neck stiffness, nausea, and vomiting. It is important to note that 80% of people infected with WNV will show no symptoms at all, and only 1 in 150 people infected with WNV will develop severe symptoms. Severe symptoms include fever, and may include unusually intense headaches or confusion. If these symptoms develop seek medical attention immediately. Symptoms will appear 3-14 days after a person has been bitten by an infected mosquito. DEET (N, N-diethyl-m-toluamide) is an ingredient to look for in your insect repellent. Follow label instructions, and always wear repellent when outdoors. Apply sunscreen first and then mosquito repellent. Reapply after sweating and swimming in the same order.